Republican presidential nominee Donald Trump has recognized the need for political action in the fight against America's opioid epidemic throughout his campaign. But his proposed solutions largely fail to account for the role of drug companies in this crisis — including some that Trump has invested hundreds of thousands of dollars into, according to financial disclosure records. At a rally in New Hampshire earlier this month, Trump credited the crowd for helping him understand the gravity of the state's drug problem. He promised that the massive wall he plans to erect along the U.S.-Mexico border would stop "dangerous cartels" and "keep out the drugs and heroin that’s poisoning our youth." The problem is that his position overstates the prevalence of heroin in today's opioid epidemic. Health experts generally agree that prescription painkillers are the driving force behind the opioid epidemic. 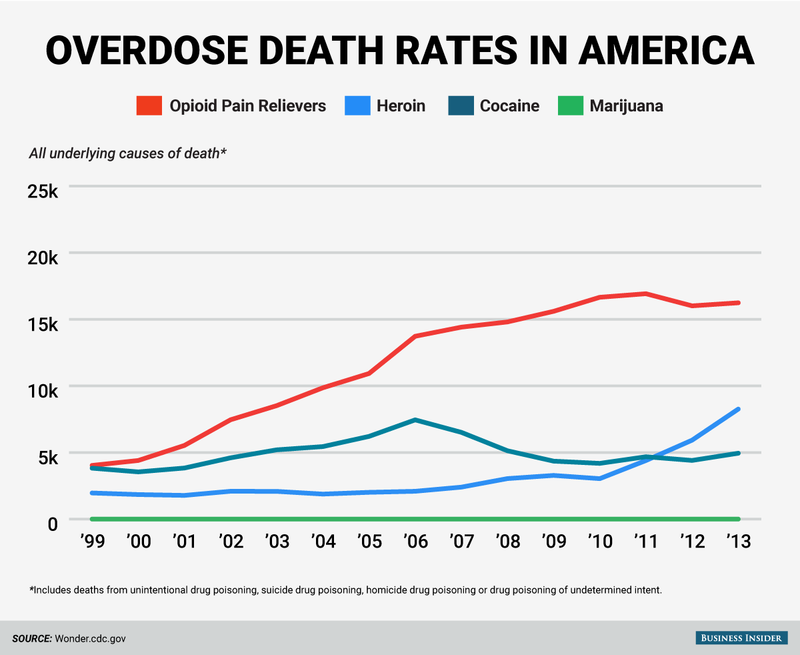 There were about 19,000 deaths from prescription opioid overdoses in the U.S. in 2014, compared to about 10,500 fatal overdoses from heroin. Among heroin users, nearly 80 percent started out abusing prescription painkillers, according to the National Institute on Drug Abuse. "Pharmaceutical companies have used their considerable resources to aggressively and sometimes deceptively market opioids for chronic, non-cancer pain," William Becker, an associate professor at Yale University School of Medicine, told ATTN:. "As such, they have had an undeniable impact on the nearly six-fold increase in opioid prescribing from the late 1990s until today." Here's what Becker said needs to be done to tackle the opioid epidemic. "My view is overhauling our nation’s approach to the treatment of chronic pain will have the most lasting impact on the opioid crisis. That includes tighter regulation on the pharmaceutical industry, improved education of physicians and other health care professionals, and increased availability and affordability of non-opioid treatments. Expanded access to treatment for opioid use disorder is also critically important. If we’re talking about highest yield interventions in a resource-constrained system, all of the above would take precedence over border control, in my view." Missing from Trump's proposal is any mention of plans to improve regulations of the pharmaceutical industry. Such changes would include reforming prescribing guidelines or requiring training for prescribers on how to identify patients who exhibit drug-seeking behavior, for example. Trump's focus on illegal heroin trafficking from Mexico reflects a myopic understanding of the opioid epidemic. Not only has Trump declined to call out the pharmaceutical industry on the campaign trail, he has also invested heavily in drug companies, including several that have been linked to the opioid crisis, according to a 2015 public financial disclosure report he submitted to the Federal Election Committee last year. Trump has invested between $2 million and $8 million in drug companies. If Trump was serious about ending the opioid crisis in America, perhaps he would do well to ask tough questions about the role of companies that produce addictive painkillers such as fentanyl, tramadol, and morphine — into which he's personally put hundreds of thousands of dollars. Investments in the pharmaceutical industry do not signal malicious intent, of course. Nor is it necessarily fair to link the candidates' respective drug policy proposals to campaign contributions from the industry — of which Trump and his opponent, Democratic presidential nominee Hillary Clinton, have received a couple hundred thousand dollars, Reuters reported. Trump is, after all, a businessman — and Big Pharma has consistently proved to be a lucrative investment. But Trump's silence on the role of pharmaceutical companies in the opioid epidemic does raise concern about his understanding of the epidemic. ATTN: has reached out to the Trump campaign for comment, but a representative was not immediately available. We have also requested comment from the drug companies listed in this article and will update this story when we receive a response. Is opioid abuse a problem in your community?